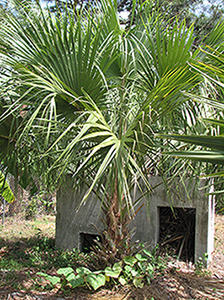 The cabbage palm (Sabal palmetto) is Florida’s state tree, and is also one of the most easily recognizable trees. It can be found nearly everywhere in Florida and is commonly used in landscaping. Cabbage palms are easily identified by the shape and size of their leaves. The leaf of a cabbage palm is very broad and there is a clear line down the middle, which sometimes makes the leaves look as if they are being folded in half. Small cabbage palms can easily distinguished from saw palmettos by feeling their stems. Saw palmettos have a jagged saw-like edge to their stems, as opposed to the cabbage palm which has a smooth edge.